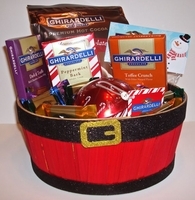 Ghiradelli candy basket is the perfect gift for the chocolate lover in a cute Santa basket. This makes a sweet gift for anyone, Ghiradelli is known for their their delicious chocolate bar and candies made with the finest ingredients sure to please everyone. You won't go wrong when buying a Ghiradelli candy Basket. You get 2 3.25 oz Chocolate bars, a 3 oz peppermint bark bar, 10 assorted flavored squares, a 3.45 oz bag of snowman buttons also known as nonpariels, a red ball Christmas ornamnet filled with 8 peppermint barks squares and a 10.5 oz bag of Ghiradelli's famous double chocolate hot chocolate mix.